A revelatory, visually stunning graphic memoir by award-winning artist Nora Krug, telling the story of her attempt to confront the hidden truths of her family’s wartime past in Nazi Germany and to comprehend the forces that have shaped her life, her generation, and history. In her late thirties, after twelve years in the US, Krug realizes that living abroad has only intensified her need to ask the questions she didn’t dare to as a child and young adult. Returning to Germany, she visits archives, conducts research, and interviews family members, uncovering in the process the stories of her maternal grandfather, a driving teacher in Karlsruhe during the war, and her father’s brother Franz-Karl, who died as a teenage SS soldier in Italy. 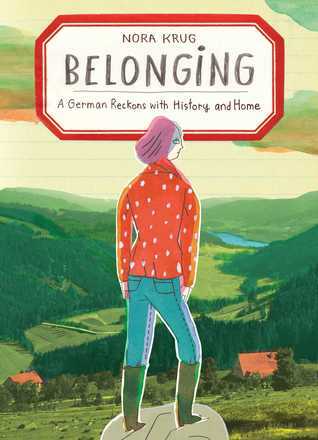 Her extraordinary quest, spanning continents and generations, pieces together her family’s troubling story and reflects on what it means to be a German of her generation. Thank you for presenting this story of Nora Krug. It simply seems the war has never ended at least in the minds eye of surviving relatives and those wishing for answers to their questions rather by voice or as unspoken. But then also my self at times of weaknesses of self restraint, but then, only the dead could answer my questions. It is very important for most German people to only discuss this subject with out the presence of most folks that were on the recieveing end of that war. For the response usually becomes very hostile and unpleasant. I have found that bit of situation the hardway on some past occasions mostly in the presence of Brits. The Russians for some reason have not been hostile with the subject, not so sure why, but results speak for them selves. I hope you can watch this link, this is one of my favorite Dutch tv programs, a literature program about books aired on sunday morning. I actually posted this thread after I first saw this TV program "VPRO Boeken" (VPRO Books) sunday. Whatch from 1:10, the interview is in English and German. I have a clear idea about Germany. Germany is a Free, democratic and Federal country and Germans themselves may decide how they want to deal with their personal, family, national, regional and state history. I do believe that the NSDAP, old school Nazi generation of 1920-1945 has passed away or is passing away. We can't blame Germans who were born during the war or after the war for the Second World War and attrocities which were commited by grandparents or parents. How bad it is and it should be condemned, examinated and the guilty should have been punished or should be punished if they are stlll alive. But you can't blame the children or grandchildren for the deads of parents, grandparents or great grandparents. Next to that to much of the blame is only directed at the Germans while Austrians, Dutch, Belgians, French people, Scandinavians, Slovaks, Hungarians, Romanians, Bulgarians, Croats, Bosnians, Serbs, Russians, Ukrainians and Baltic people took part in the war. Ukrainian, Russian, Baltic and Dutch nazi's killed Western slav Poles and Polish jews. Look at Vychy France, and the Slovak Republic (1939–1945);Slovenská republika), otherwise known as the Slovak State (Slovak: Slovenský štát). During World War II, the Kingdom of Hungary was a member of the Axis powers. And the Independent State of Croatia (NDH), a Nazi-backed puppet state. I can go on and on. We shouldn't forget that past and we don't do that, but we have to see the historical circumstances of the First World War (1914-1918), the Interbellium years (1919-1939), The Great Depression and the Second World War (1939-1945) and the role of Fascism (1922-1945), Nazism (1933-1945) and Stalinism (1927-1953) played in that time with despair, poverty, hunger, unemployement and political radicalism and extremism. I the Weinar republic there was fear for communism on the side of the old Prussian military order, conservative Roman Catholic Bavarians and Austrians, and many other conservative and center right liberals and democrats. The left ws poarized betweeb 2 opposing movements, the Social Democrats on one side and the communists on the other side. In the rightwing corned different kinds of nationalists and Monarchists, fascists and nazi's competed over power and influence. That is gone today and we face new problems we have to solve. The rise of the rightwing populist movement in Europe is worrisome, but these people aren't Nazi'or righywing populism. A marginal fringe of the voters vote for the Populist parties, but they keep growing. Once again thank you most kindly for presenting this of Nora Krug. I was to watch this through, not for curiosity. But for the fact she strikes very close to home with her expressing her feelings and reactions to other non-German people and how she was treated. Some of Nora's reactions and feelings of the war and her fathers role in the war time military are very personal and familiar. For one thing in the reality of things, in war time Germany, if not a party member, was very dangerious for one thing, and for a front line solder, this fact would tend to slow most all advancements in both rank and receiving of medals. For as with this, also, could be dangerious if for the fact as a non-party member, some could take offence and in the heat of combat, place with intent, this respective solder in line of fire. Ms. Krug speaks very honest in her personal reactions that more or less mirriers my own reactions when in a social situation. I mean nothing with a question of this presentation that disturbs you. We are all friends here and my question is only out of curiosity and I do not mean any thing other wise. If there is some thing my self may have said that is a cause of disturbance to you, I would will make it harmless.